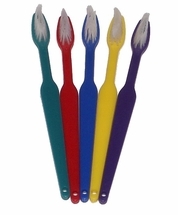 These toothbrushes are all high quality, and will do a good job cleaning your teeth. 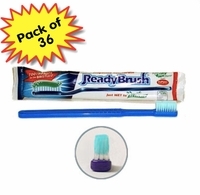 Brush your teeth at least twice every day for two minutes for the most effective cleaning. If you need a pre-pasted toothbrush, we carry two types: the ReadyBrush (in packs of 30 or 144) and an economy box of 100 pre-pasted toothbrushes. 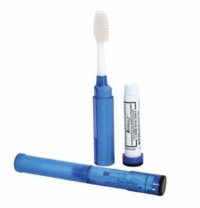 We have a good travel toothbrush, and even an OraBrush tongue cleaner. 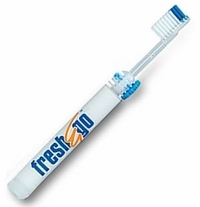 Fresh&Go is a unique product which has 30 applications of toothpaste built into the handle. Just give the dial on the handle a turn to get one application of toothpaste. 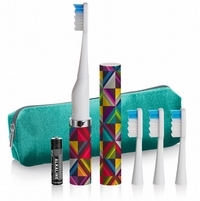 Fresh & Go comes in packs of six toothbrushes each.